You’re really impressed with the work your staff has put into your website. In fact, when your peers tell you that they outsource their online content, you chuckle at the money you’re saving: you have a dedicated writer who continually writes strong content, and you haven’t noticed a single typo yet. However, your competitors may have one advantage over you: an extra set of eyes that turns good writing into the heart and soul of your business. Why Do I Need a Web Content Editor? Many people don’t understand the need for an editor. Since the rise of blogging and social media, there is barely a pause between thinking of a post and instantly publishing it for all of your readers to see. But an editor is more than just a human spellchecker; she is vital to crafting the best possible content on your business website. Proofreader. Editors dot the i’s and cross the t’s, but that is only most basic requirement of a good editor. 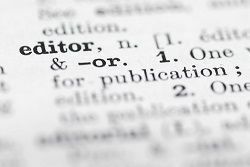 A grammatically correct piece is not necessarily a good one, and editors may have to make deep cuts, reword whole sections, and even make the original unrecognizable from the first draft. Audience. Editors are the first audience for a piece of content, and for good reason. They can play the part of both the writer and the audience—often simultaneously. A writer may have read his own piece six or seven times and thought it was stellar; an editor approaches it dispassionately (and has no problem revising it if she is bored after the first paragraph). Agent. Writers are creative types. They explore tangents, use flowery language, and depend on anecdotes or outrageous metaphors to pull the reader in. Sometimes writers get so caught up in the process they lose sight of the goal, swimming further and further from shore. Just because a writer loves his work doesn't mean your customers will want to read it. The editor is the sharp-eyed lifeguard who won’t hesitate to blow the whistle. Your Writing Staff Is on the Front Line! This September is National Be Kind to Writers and Editors Month: a prime time for you to consider the people who create the all-important first contact for your website. No matter who creates your content—be it a team, one member of your staff, or you yourself—take a moment and reflect how well your business has done due to the words on the page. If, however, the numbers aren’t quite where you want them to be, we can help. Download your copy of our Guide to Great Web Content, or call us today at 866-460-3724 to have us create custom content for your site.